While this year’s Vancouver International Film Festival holds much that will be of interest to Jewish Independent readers, the list is short when it comes to specifically Israeli or Jewish-related films that will appeal. Perhaps surprisingly, the Israeli films are harsh critiques of Israel. Beyond the Mountains and Hills (Israel/Germany) is about a dysfunctional family (a metaphor for the country), Junction 48 (Israel/Germany/United States) is about an Arab-Israeli rapper who faces racism, among other Israeli-inflicted ills; Between Fences (Israel/France) is a documentary about Israel’s internment of African refugees at the Holot Detention Centre and Vita Activa: The Spirit of Hannah Arendt (Israel/Canada) is about Hannah Arendt, who, among other things, was critical of Jewish leadership during the Holocaust and did not approve of the state of Israel as it was founded. Among the other film offerings is Keep Quiet (United Kingdom/Hungary), a documentary about Csánad Szegedi, the staunch antisemite who helped found Hungary’s far-right party Jobbik and its Hungarian Guard, which has since been banned. As a member of the European Parliament, he continued to foment hatred until a fellow nationalist and racist outed him as being Jewish – his grandmother had not been the adopted daughter of the Klein family, as she told him, but their daughter. The documentary includes interviews Szegedi did with his grandmother (about her imprisonment in Auschwitz, and other matters) and a conversation with his mother, who also found out later in life that she was Jewish. He asks both women about his increasing embrace of antisemitism over the years, why didn’t you stop me? Their responses are thought-provoking and sad. Keep Quiet does not accept Szegedi’s transformation unquestioningly and gives speaking time to the doubters, as well as the cautious believers, such as Rabbi Boruch Oberlander, head of the Orthodox Rabbinical Council in Budapest. Oberlander has supported and taught Szegedi since the former antisemite contacted the rabbi for help. The event that ends the film is Szegedi’s attempt in 2013 to speak in Montreal about his Jewish journey – he wasn’t allowed to stay in the country. Before being put on the next plane home, however, Szegedi recorded a lecture, which was played at the event, with Oberlander fielding the hostility it wrought in some attendees. In Oberlander’s view, we must love every Jew, no matter how wicked. Of his choice to help Szegedi, he says, “I pray that I shouldn’t be disappointed.” Even Szegedi is unsure as to whether he would ever turn his back on Judaism – maybe, he admits, but not likely. The way in which the filmmakers present Szegedi’s story is informative and balanced, and viewers get a sense of the man and his deeds, as well as about Hungary and how a political party as racist as Jobbik can find success there. Another of Arendt’s theories – about refugees – remains relevant. With no rights, refugees are considered “superfluous” by a regime, she argued, and denationalization and xenophobia become a powerful weapon of totalitarian politics. 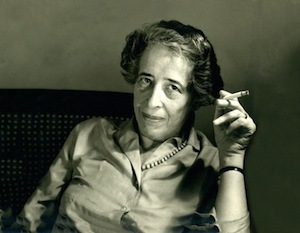 In addition to her early work, Vita Activa touches upon Arendt’s personal life, which offers some further understanding of the philosopher, who was seen by many to lack empathy. In one interview, she talks about how Auschwitz shouldn’t have happened, how she could handle everything else but that. Yet, she criticized the Jewish leadership who cooperated with the Nazis – the councils and kapos – and hypothesized that, if there had been no such leadership, there would have been chaos and suffering and deaths but not six million. One professor interviewed for the documentary calls Arendt’s comments “irresponsible,” another says they showed her complete ignorance of history, yet another says she regretted her remarks later in life. Reconciliation and forgiveness don’t enter the picture in either the documentary Between Fences or the fictional (but based on a real person) Junction 48. They each highlight important, even vital, issues in Israeli society, but do so in such a condemnatory, predictable way that anyone but the choir won’t be able to sit through these films. 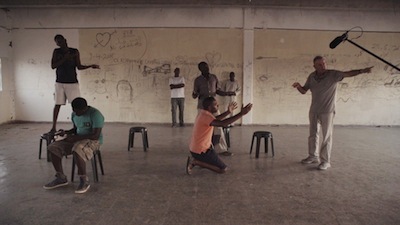 Without much context, Between Fences looks at the poor situation in which asylum seekers from Eritrea and Sudan find themselves when they reach the safety of Israel. In many countries, these asylum seekers face problems, but viewers wouldn’t know that from this documentary, nor would they begin to understand the atrocities being committed in their homelands. However, they will learn how Israel doesn’t recognize their refugee status and makes every effort to send them back, how racist Israelis are towards these newcomers and a host of other problems with Israel and its people. Not one government official or Israeli is interviewed, although some Israelis participate in the “theatre of the oppressed” workshops in Holot on which the film focuses. In addition to leaving many questions unanswered, the film also begins and ends confusingly and is slow-paced. We then meet Kareem, an aspiring young rapper, whose parents are worried about his involvement with drug dealers and his future in general. His friends not only deal and take drugs, but visit prostitutes and dabble in other criminal activity. Nonetheless, every Israeli they encounter is the real bad guy, from the police to other rappers to the government, which is knocking down one of their homes to build a coexistence museum. Oh, the irony. The only entertaining and thought-provoking aspect of this film is the music by lead actor and film co-writer Tamer Nafar, which is available online. In the end, the Jewish Independent chose to sponsor what a VIFF programmer called a “classic Jewish comedy,” though, having seen a screener of the film, the Jewish aspect is hard to discern. While much lighter (and non-political) fare than the other offerings, it has much to say – or show, really, as the dialogue is minimal – about social awkwardness and a lack of direction in life. The protagonist, Mike, works at a pizza place in New Jersey and has the energy level of a slug and the magnetism of zinc. Yet, somehow, he has friends, albeit not great ones. Short Stay is one of those films that moves apace with its main character, so slowly and in all different directions, as Mike both physically wanders the streets and mentally wanders to destinations unknown. Viewers don’t gain insight into what motivates Mike, who seems unperturbed by his lack of career, social skills, direction and future, but they root for him, empathize with what must be his loneliness. Short Stay director Ted Fendt best describes the acting of the nonprofessional cast, many (all?) of whom are his friends. “The film contains a range of performance styles from the fairly natural (Marta and Meg), to Mark and Dan’s B movie ‘villains,’ who might have stepped out of an Ulmer or Moullet film, to the quasi-Bressonian, unaffected manner Mike delivers his lines.” And therein is a Jewish link, Edgar G. Ulmer. Another Jewish filmmaker – Vancouver’s Ben Ratner – will be premièring his short film, Ganjy, at this year’s festival. About a former boxer suffering from dementia pugilistica, who is in desperate need of help when three friends visit, Ganjy was inspired in part by Muhammad Ali. Its creators are looking to fundraise enough to take the film to other festivals, as well as contribute to the Muhammad Ali Parkinson Centre. For more information, visit indiegogo.com/projects/ganjy-film#. For more information about and the full schedule of films playing at VIFF, visit viff.org. Note: This article has been edited so that it is clear Hannah Arendt was speaking of tendencies within Zionism that she considered “plain racist chauvinism” that do “not differ from other master race theories,” and not condemning Zionism as a whole.